SupportYemen held an event on January 3rd entitled “Women’s Citizenship and their Political Participation in the Constitution”. A prelude to the discussion included the texts on citizenship in the Yemeni constitutions of 1978-1994 and the suggested amendments. The 47 participants were divided into 7 focus groups to discuss the articles in the appendix and the suggestions relating to these articles, adding comments regarding the suggestions in addition to discussing the possible obstacles that can be faced if these suggestions were carried forward. The event ended with a general group discussion following the focus group discussions. • Amendment of article (4) from the constitution “the people own the power and are its source, and they exercise it directly through the referendum and general elections and indirectly through the executive, legislative and judiciary bodies and through the local elected councils.” to include women’s representation in these bodies to be no less than 30%. • Adopting the proportional list system or the mixed system to guarantee women’s participation considering that they are among the marginalized categories that would be protected by the proportional list instead of the single individual electoral system, which is adopted in article (63) in the current constitution. • Adding the feminine description to the conditions of the president of the republic as condition (F) of article (107) in the current constitution so that it is modified from “is not married to a foreigner and does not marry a foreigner during his term” to “Is not married (feminine/masculine) from a foreigner (feminine/ masculine). 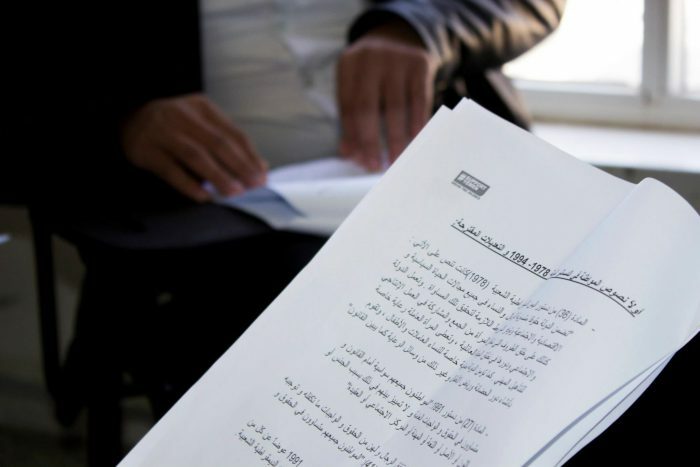 According to the previous constitutional suggestions, a minimum of 30% women’s participation percentage should be considered in the new electoral law which presumably would be drafted after drafting the new constitution which will determine the shape of Yemen’s future state and accordingly the nature of the new electoral law and how to define the motivational circuits for women in the parliamentarian and local elections. • Some of the participants agreed that the identity of the state emerged through the changes that occurred on the articles of citizenship in the constitution which for example had clearly socialist features in article (36) in the 1978 constitution and later a theocratic feature in articles (31 and (41) from the 1994 constitution. • The majority agreed that article (27) from the 1991 constitution is the most compromising and moderate and there were suggestions to make article (27) a preface to article (36) from the 1978 constitution so that they merge in the new constitution. On the other hand some viewed article (27) as sufficient to address citizenship and that article (36) of the 1978 constitution includes important details that should be included as a law and not in the constitution. • Someone suggested the replacing the word “provides” by the word “contributes” regarding the states commitment towards women and families in article (36) of the 1978 constitution since the state is no longer the socialist type. • It was noted how the groups were focused in how to balance between article (27) from the 1991 constitution and article (36) from the 1978 constitution, yet all groups agreed on the importance of these two articles and preferring them over the two existing articles in the 1994 constitution. • Most of the groups agreed on the importance of including a quota for the percentage of women’s representation, yet there was disagreement determining that percentage. Some suggested the clear quota of a minimum of 30%, in the 3 main branches, which is in article (4) of the current constitution. While others suggested leaving it open so as no to limit women to this percentage who might in the long term be prohibited from attaining a higher percentage in the future. • A long discussion revolved around the importance of implementing the quota system in a way to guarantee the selection upon merit and not just the numerical representation. • Most of the groups agreed on the importance of determining the kind of proportional list and the necessity of determining the different type of systems for the proportional list. • Some considered adding the feminine pronoun in article (107) in relation to the condition of presidency might not be in favor of women considering that this amendment might provoke the extreme political Islamic forces to demand a clear text which prohibits women from assuming a presidency role, while others that adding it to the language of the constitution might encourage society to accept the political participation of women in all aspects. • The absence of an effective women’s movement with a public base that supports and demands these amendments. • The absence of solid political forces in the face of tribal and extreme political Islamic forces. • The parties’ holding departments for women marginalizes the role of women in parties and excludes women from decision making within or outside their parties. The event ended with SupportYemen team committing to sending the outcome of the discussion to all the participants, keeping the door open for discussion in it’s Facebook page and supplying it with material related to the subject. It is worth noting that the participants who joined the discussion electronically are approximately 150. 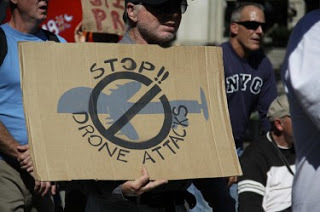 Why US Drone Attacks Should Stop in Yemen and Elsewhere!